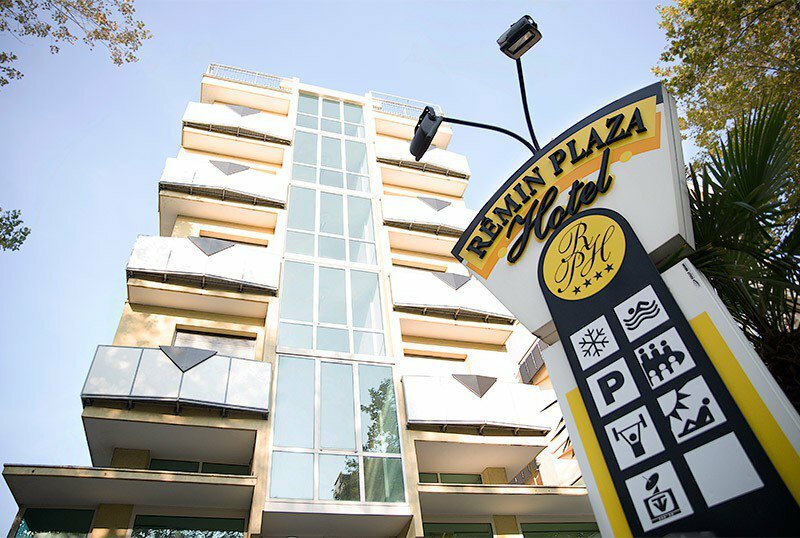 In Rimini Marina Centro, the Rèmin Plaza is a 4-star hotel located a few steps from the sea. It offers unattended parking, a small indoor pool, gym and WI-FI. Pets are allowed. The hotel is located in Marina Centro di Rimini, directly overlooking the seafront. The equipped beaches can be reached by simply crossing the road. The area is well connected to the center of Rimini and Riccione thanks to the bus line n. 11 which stops a few meters from the hotel. The rooms have a balcony, floors in gress porcellato, air conditioning, WI-FI, telephone, safe, bathroom with suspended sanitary, shower and hairdryer. On request: minibar and breakfast in the room. Both are available in single, double, double, triple and quadruple solutions. EXECUTIVE: elegantly furnished rooms have a balcony with a lateral sea view. ROYAL: even more elegant, they offer a view of the sea and the beach, as well as a Jacuzzi tub (or shower cubicle without a hydromassage). Indoor swimming pool, garden, lift, bar, equipped gym, reading room, conference room and laundry. PARKING: fenced parking, subject to availability. CONVENTIONS: beach, amusement parks and discos, law enforcement agencies. PETS: allowed with payment of a supplement. BREAKFAST: served buffet style in the dining room with a panoramic view, with both sweet and savory dishes such as brioches, cakes, cereals, fruit, cold cuts and cheeses. LUNCH AND DINNER: a choice of 4 first courses and 4 second courses, with meat and fish dishes. At the end of the meal, desserts and homemade cakes. VARIATIONS: vegetarian and gluten-free dishes available. In the hotel: children's pool, entertainment, baby / mini / junior club, pediatric counseling, baby sitter on request. At meals: baby menu, seats at the table. 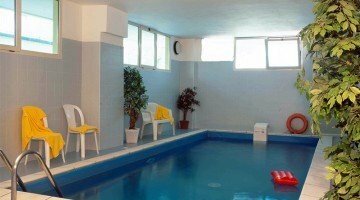 Guests of the hotel can take advantage of the hotel's indoor swimming pool. It is small, 7x3 meters and 150 cm deep, and is equipped with a hydromassage jet. Around are chairs, inflatables and games for children. In the hotel there is a wellness corner, on the ground floor, equipped with a treadmill, an exercise bike, a multifunctional bench, a step and a rowing machine. The hotel has an agreement with the Bagno 75 bathing establishment with entertainment for children, bocce court and services for adults, relaxation area, aperitifs and parties with live music. Your Easter holidays at the seaside pass with us by the sea. all children up to 12 years 50% discount.